7.19 points at 27 votes (rank 304). As an outpost of the Earth there is the space station Jupiter in the planet Jupiter. Alien creatures from a faraway sun system now want to occupy the space station again. 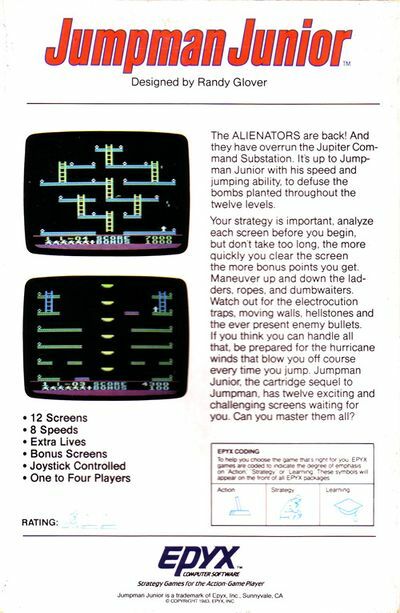 As follower of super secret agent "Jumpman" it is your task as "Jumpman Junior" to collect the aliens' bombs in 12 areas (levels), before they destroy the space station. Your only weapon against the aliens is speed, enormous springiness and your courage. The game is almost exactly played as the forerunner Jumpman. Also here the name of the level implies what will happen. Some ideas and designs of the levels are new. 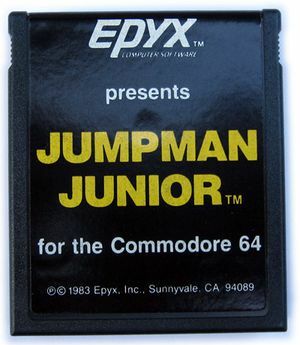 The number of players is chosen in the title screen, as well as the speed (1 is fastest to 8 the slowest) of Jumpman Junior, which cannot be changed during the game! 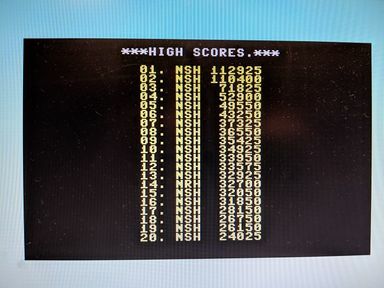 Furthermore, there is only a list of points for the highscore. The levels are designed rather simply, i.e. most participants are unicoloured but the level altogether is multicoloured. Creatures, especially Jumpman Junior, are animated. Simple souund effects as the jumping and running of Jumpman, movement of creatures, the missiles or bombs accompany the game. A short tune is played when losing a life, at the end of a level and at the end of the game. After playing through the first 12 levels there will be further levels chosen randomly from the first 12. Each collected bomb gets you 100 points. When completing a level there is a time bonus for speed and also a bonus for each life that is left, which is calculated with 25*level number*lives. So a maximum of 300 bonus points for each live from level 12 onwards. You start with 4 lives, each 7.500 points there is an additional life. 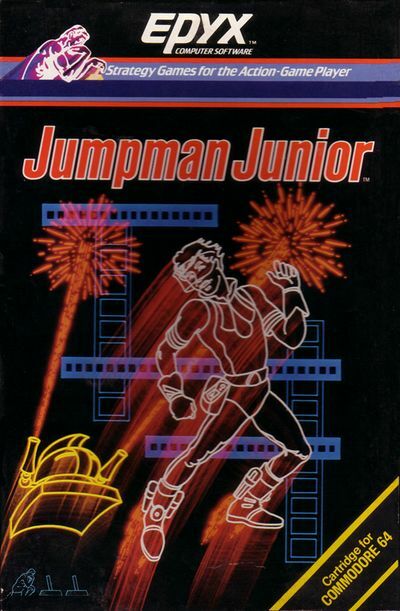 In the game there are 2 types of ropes which Jumpman Junior automatically climbs up or down. You can also jump from or onto the ropes! Green ropes: He only climbs upwards. Blue ropes: He only climbs downwards. Caution: Jumpman Junior's speed also effects the speed of the creatures. The solution for the single levels are shown in the longplay video from the C64 game video archive (see links). The version by "Remember" has next to different cheat modes (unlimited lives, sprite collision off, jump level) also a saveable highscore list. Jodigi: "Also one of my first games. Rather hard to play, but if you know how to play it, it has its charm." Robotron2084: "At least as good as the forerunner Jumpman. The improved controls raise the fun in the game additionally. 7.5 out of 10 points." Shakermaker303: "Quite pleasant, but the design could have been better. When choosing the colours there was probably somebody colour-blind involved. 6 out of 10 points!" This page was last modified on 25 January 2019, at 08:25.